This year Marionnaud is Santa’s right hand brand helping the little ones plan surprises for their beloved moms. “Letter to Santa for mom” is their simple way of expressing their love, writing for Santa what they want him to bring their mothers for Christmas. 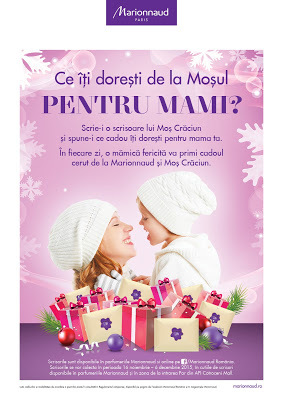 From 16th of November to 6th of December all these letters to Santa will be gathered in special boxes you can find in all Marionnaud stores and the FAR entrance of AFI Cotroceni Mall. With their mother’s help, the children can also download the letter from Marionnaud’s Facebook page.